The Asia and the Pacific region contains some of the world’s most powerful economies—and two-thirds of its poorest people. Rich in political, cultural and other forms of diversity, it faces common challenges from stark socioeconomic disparities, including those linked to gender. Many countries have made formal commitments to gender equality, but implementation is undercut by a variety of factors, from limited resources to inconsistencies in upholding laws to upheaval from natural disasters. Integral to Asia’s economic boom, women make up nearly half of business owners. Aside from East Asia, however, they have a higher unemployment rate than men, almost twice the global average. In the majority of countries, migration remains a primary means for securing a livelihood, with female migrant workers often equalling or exceeding the number of men on the move. As is true for employment in general, however, many end up in poorly paid jobs with no protections, especially in care and domestic work. 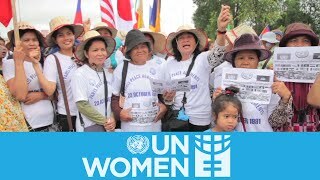 Through its regional office in Bangkok and a number of country and multi-country offices, UN Women builds on a long history of support to governments and women’s movements. We advocate for aligning legal frameworks and election processes with the goal of women’s increased participation in political and other forms of decision-making. We assist legislative reform measures to stop violence against women and girls, including in markets and cities, and help extend services to survivors and ensure the implementation of effective existing laws. Our economic empowerment programmes seek greater security for marginalized groups of women, encompassing home-based workers, migrants, rural women, informal market vendors, and women vulnerable to climate change and natural disasters. A regional initiative for migrant workers stresses access to justice, the management of migration to respond to differences between men and women, and the application of international standards protecting women migrants regardless of what type of job they do. Other programmes in Asia and the Pacific involve partnering with women in their efforts to engage in peace and reconstruction efforts, and push for gender equality provisions integral to mitigating and responding to natural disasters. To bolster gender-responsive budgeting and public planning, we assist efforts to monitor the different impacts of budget and policy choices on women and men. Visit the Asia and the Pacific Regional Office website for more information. Over 120,000 people in Phnom Penh have been evicted from their homes since 1990. But women are fighting back. This video goes to the streets of Cambodia's capital to feature one story. UN Women is one among many agencies supporting land rights in Cambodia, particularly building on crucial work of our sister UN agency, the Office of the High Commissioner for Human Rights (OHCHR).